How Do You Wear Your Landing Pages? 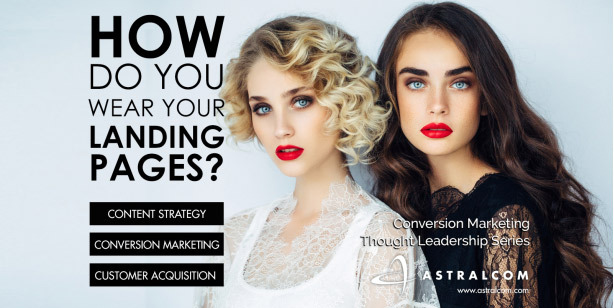 | ASTRALCOM - Content Strategy, Conversion Marketing and Customer Acquisition. 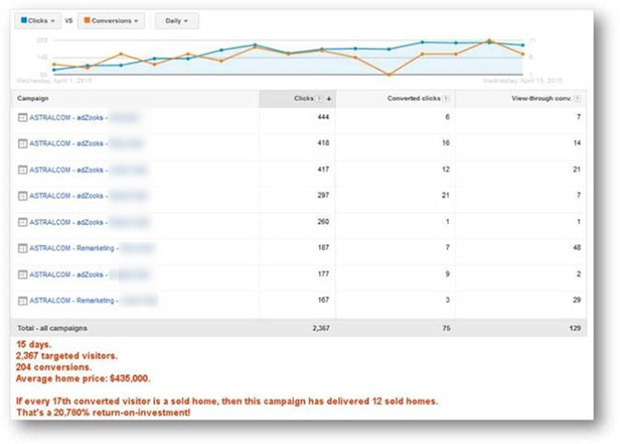 Conversions are the holy grail of digital marketing. They are considered as the ultimate outcome and serve as the official hand-off to the sales team. But, of the 4 C’s in the Mechanics of a Conversion, the 4th C is the most difficult for homebuilding marketers to deliver on. And that’s primarily because something is missing in the prior customer experience element – the 3rd C.
Yet, homebuilders across the board continually spend millions of dollars on drawing potential homebuyers to their websites, only to result in appallingly low lead conversion rates. Most homebuilders have settled for very low lead conversion rates – in the 1% to 3% range – when they could be doing exponentially better. Based on our experience with homebuilders across the nation, we’d venture to guess that your conversion rate is not greater than 5%. Even if it were 5% or more, what would it be worth to you, if you could double your current conversion rate? The 3rd C is where the proverbial rubber meets the road. It’s the customer experience. Basically, the better the customer experience, the higher the lead conversion rate. But what constitutes a good customer experience? What about a great customer experience? In conversion marketing, there is a long-standing argument about how much content is needed to create a good customer experience. The prevailing opinion is that the greater the purchase cost or risk, the more content is needed to support that purchase decision. This leads to a secondary argument related to the length of landing pages. The question here being, do longer landing pages perform better than shorter ones? Here’s a great article that illustrates both the content amount and landing page length arguments in more detail. In most cases, buying a new home is likely the biggest purchase a family will ever make. Therefore, more content will be required to help facilitate that purchase. Content that helps differentiate new vs used homes, buy vs rent benefits, etc. Then, how should this content be provided – via long or short landing pages? Finally, how should this content be organized? The answer to these specific questions is contingent on several factors that include the buyer demographics, the particular message and/or offer, the competition and market conditions. In some cases, like promos and special offers, short landing pages may work better. Yet, in cases that involve competitive differentiators, educational messages and comparisons, longer landing scenarios may be more effective. Whether more or less content, or long or short landing pages, creating a good landing page scenario helps deliver higher outcomes. Speaking of returns, most homebuilder marketers would agree that a 2:1 ratio would be an ideal return on marketing investment. Yet what if you could deliver a 5:1 ratio, instead? What about a 207:1 ratio? Or, maybe even an 860:1 ratio? It’s true. Have a look at this screen shot from a campaign we’re running for another homebuilder. 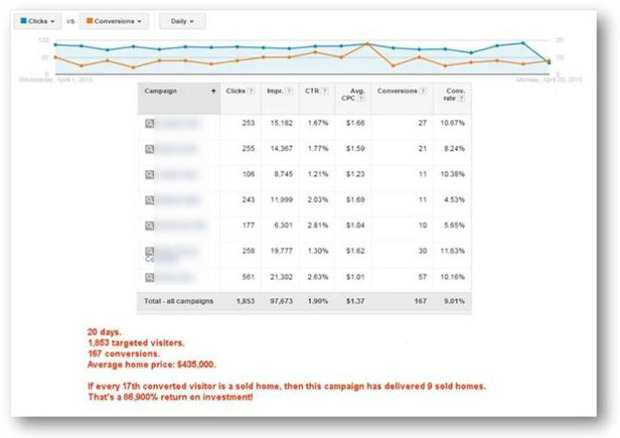 With the majority of these campaigns converting in double-digit territory, this builder is enjoying a robust 86,000% return on marketing investment – in only one specific channel – over only a 3-week period. For less than the cost of a billboard or a radio spot, you could have an effective conversion landing page; turning more visitors into more converted leads for your sales teams, all day, every day. This is precisely why more homebuilders choose ASTRALCOM. Because when it comes to digital marketing for homebuilders, we make it happen better than anyone else does. We love to create inspiring, engaging and informative experiences that produce outstanding results. We’ve helped homebuilders across the nation to connect with homebuyers in more inspiring and meaningful ways that have resulted in more sales of new homes. We know how to connect with, engage and convert your website visitors into your homebuyers. It’s because we know how homebuyers use the web during their journey to a new home purchase. If you’re serious about lifting your lead conversion rates, want to learn more, or have questions, connect with us today.